I mean it's bad enough that she has to live illegally in a seniors-only building with her grandmother while her mother tries to make it as a move star. And worse that she witnessed a burglary in progress--and that the theif saw her. And worse still that nosy neighbor Mrs. Graybill is onto her, and that the thief is after her. But on top of all that, she also manages to make an enemy of the queen of mean at her new school and get suspended on the first day. Welcome to the wild world of Sammy Keyes! WENDELIN VAN DRAANEN was a classroom teacher for many years before becoming a full-time writer. 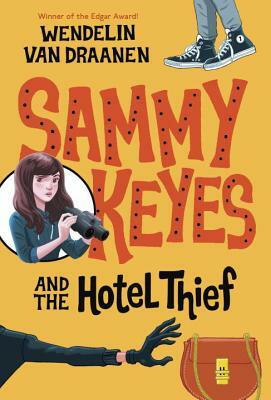 The books in the Sammy Keyes mystery series have been embraced by critics and readers alike, with Sammy Keyes and the Hotel Thief receiving the Edgar Allan Poe Award for best children’s mystery. Wendelin is also the author of many award-winning novels, including Flipped, The Running Dream, Runaway, Confessions of a Serial Kisser, Swear to Howdy, The Secret Life of Lincoln Jones, and Wild Bird. You can find her online at WendelinVanDraanen.com and @WendelinVanD, and you can follow Sammy Keyes on Facebook.